Laura is a business consultant, facilitator and writer. She has a broad understanding of both the rewards and challenges of entrepreneurial life as well as the corporate and non-profit sectors. Laura is an associate consultant with ViRTUS, and Authentic Leadership Global, Inc. She brings a variety of facilitation, strategic planning, team building and leadership tools into her practice. 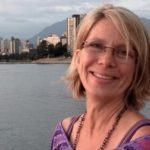 Known as a connector, Laura is passionate about sharing her experiences with ‘netweaving’, actively connecting those with similar interests and activities. She also is a volunteer facilitator of restorative justice with the North Shore Restorative Justice Society.